S.T. Joshi has established himself as a leading critic and scholar of the weird tale. Having begun by studying the work of H. P. Lovecraft, Joshi has expanded his interests to include the entire range of horror fiction from such classics as Lord Dunsany and Algernon Blackwood to such contemporaries as Ramsey Campbell, Stephen King, and Clive Barker. In this generous sampling of the reviews that Joshi has written in nearly thirty years as a critic, we find trenchant analyses of writers ranging from Arthur Machen, E. F. Benson, and Shirley Jackson to Peter Straub, Thomas Ligotti, Norman Partridge, and David J. Schow. Joshi also addresses such significant themes in horror fiction as the subgenre of dark suspense, the haunted house, Arkham House and its legacy, and the work of the small press. Of particular note is a lengthy section devoted to H. P. Lovecraft, including studies of an array of Cthulhu Mythos writings and detailed examinations of recent Lovecraft scholarship. Joshi’s essays and reviews are enlivened with a pungent wit and literary flair that bring to mind the work of John Clute and Brian Aldiss. S.T. Joshi is the author of such works as The Weird Tale (1990), H. P. Lovecraft: A Life (1996), and The Modern Weird Tale (2001). 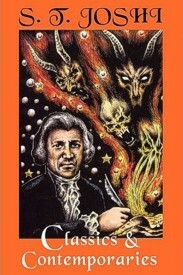 He has edited or coedited such important reference works as Supernatural Horror Literature of the World: An Encyclopedia (2005) and Icons of Horror and the Supernatural (2006). His numerous publications have received the World Fantasy Award, the British Fantasy Award, the Horror Writers Association Award, and the International Horror Guild Award. What the Hell Is Dark Suspense? Herbert S. Gorman: Where Is the Place Called Dagon? Classics & Contemporaries: Some Notes on Horror Fiction. By S.T. Joshi. New York, NY: Hippocampus Press; 2009; ISBN 978-0-9814888-3-7; softcover; 296 pages.